I just threw together this example image from a screenshot. 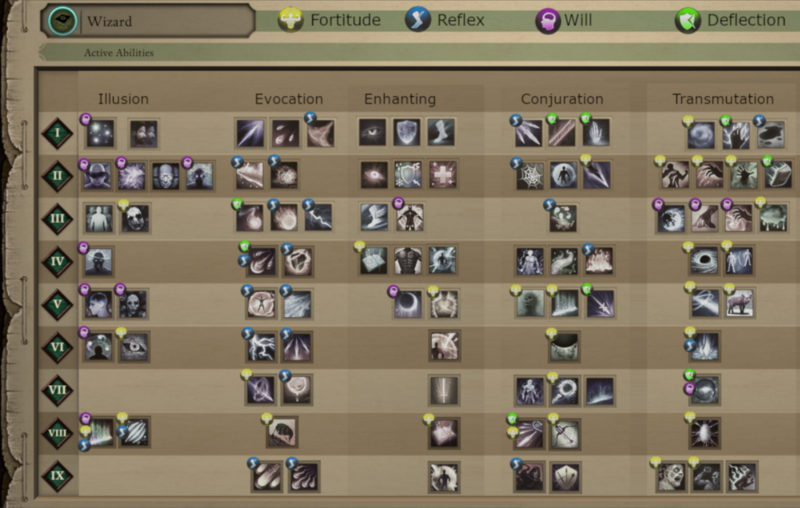 NOTE: The spells that have no "defense icon" in their top-left corner, either is a buff/summon or always hits. Get a better understanding of the limitations of the Wizard specialization choices. What are you opting out of when you pick a certain school? I found it was very difficult to determining which spells you loose at glance. Oh, but wait. Illusion doesn't have a 7th or 9th level spell. So, that was what Josh was referring to in one of the update videos. Not all summoned weapons target deflection, perhaps my Battle Mage should pick up both staves. What spells should I pick at level up? Should I pick the 2nd level spell that causes blind when you already have the 1st level spell Chill Fog. Oh, one targets the opponent's Fortitude while the other targets Will. What do you all say, wouldn't you like to see similar tool in game, or are you all making your own spread sheets, or keep it all in your head? Edited by FluxWing, 10 August 2018 - 01:34 PM. I would say it's beyond my understanding why it's not in the game. This is really good and mandatory to the game imo. But it would be even better if you swapped the Transmutation and Enchanting columns so that the schools follow their order. What I mean is: if you consider that the last one (it would be Transmutation) is beside the first one (Illusion), then you would easily know which schools are forbidden for the subclasses, because you'd only be able to choose the adjacent columns. Edited by InsaneCommander, 24 June 2018 - 06:15 AM.